intense heat and radiation emanated in all directions, followed by a powerful blast. Some were grievously burned by the heat wave. Others were thrown and smashed into buildings by the blast. 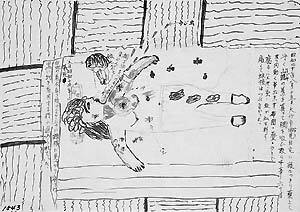 Others were pierced by fragments of broken window glass. leaving behind only a few ferro-concrete structures. that "scorched the sky" all day long. Those trapped under collapsed buildings were burned alive. Radiation destroyed the cells of those exposed. This damage manifested in a variety of symptoms, including fever, vomiting, diarrhea, hair loss, and hemorrhage. nevertheless died from the effects of radiation. from the scorched plain remain vividly etched in the memories of those who saw them. 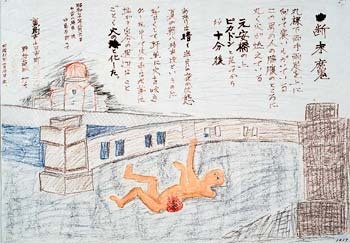 Here, we will show what happened in Hiroshima using pictures drawn and journals written by survivors. Eizo Nomura (then47) was working for the Hiroshima Prefectural Fuel Rationing Union in the Fuel Hall (now the Rest House in Peace Memorial Park) in Nakajima-hon-machi (now Nakajima-cho). The A-bomb exploded when he was in the basement looking for documents. He barely escaped toward Koi through furious fire and thick smoke. Later he hovered between life and death with high fever, diarrhoea, bleeding gums, and other acute effects of radiation. "Outside, it was dark because of the black smoke. It was about as light as night with a half-moon. I hurried to the foot of Motoyasu Bridge. Right in the middle and on my side of the bridge I saw a naked man lying on his back. Both arms and legs were extended toward the sky, trembling. Something round was burning under his left armpit. The other side of the bridge was obscured by smoke, and the flames were beginning to leap up." "We noticed that in some places on the Motoyasu River, the water was rising. Just then, it started circling and whirling and climbing high into the air in a cylinder. It was a waterspout! From the top the water fell in the direction of the wind. The fire was getting more violent. We found ourselves attacked by smoke and sparks from the other side of the river. We climbed the stone steps in terror, running toward an open space. Now sparks from that direction attacked us. 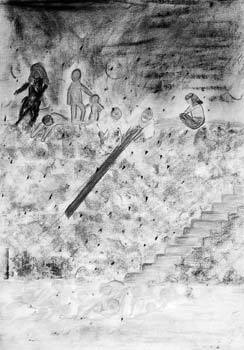 With no other choice, we returned to a corner of the stone steps we had been on before and huddled in a small group. Again and again, we dipped the tin roofing we were using as a shield into the river, and endured." Looking toward the hypocenter from Zaimoku-cho (where the Main Building of the Peace Memorial Museum is now). In the foreground is the Hiroshima Industrial Promotion Hall (now the A-bomb Dome). To the left and right behind the dome is the Hiroshima Prefectural Commerce Association (now the Hiroshima Chamber of Commerce and Industry). To the right in the foreground is the Fuel Hall, where Eizo Nomura was exposed to the bomb (now the Rest House in Peace Memorial Park). This area lined with stores and residences was one of the most prosperous commercial districts in the city. It was reduced to rubble by the atomic bomb. 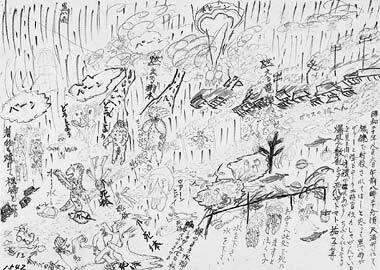 To Convey the tragic consequences of the atomic bomb, the city of Hiroshima solicited A-bomb experiences in 1947. 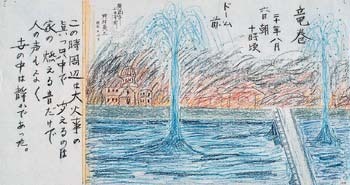 Of the 164 storis received, 18 were printed in a booklet called Record of A-bomb Experience published in 1950, which was distributed to those involved. Eizo Nomura's memoir entitled Exposed at the Hypocenter was the lead story in that booklet. Sadako Doi (then 21) was exposed to the bombing on the second floor of the new Fukuya Department Store building in Ebisu-cho. Severely injured on her head, she and her two co-workers helped each other to cross a river and take refuge through engulfing flames. At the night, she stood on the top of a mountain and saw the crimson sky above the city. Her joy to see her family alive was soon gone, as her parents and sister succumbed to illnesses related to A-bomb radiation. "Something oily glared on the water surface. Some people were immersing their burnt bodies, some were carried by the current. Countless pieces of wood and all manner of debris were floating in the water. I thought I could swim across, so I removed my shoes and tied them together with their laces. Blood from the injury on my left leg had turned my white shoe bright red. When I waded in, the current was faster than I had thought. Finally, my feet touched bottom and I thought I had reached the other side. That is the last thing I remember." 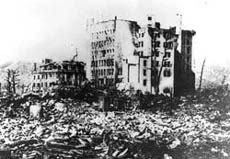 The damage extended to all districts of the city; 90% of all buildings were burned or destroyed. Countless people trapped under buildings were burnt alive. Kazuo Matsumuro (then 32) was exposed at his home in Yagenbori-cho. Enduring the pain of a broken pelvis, he escaped leaning on a staff. He saw people caught under their burning houses calling for help, but there was nothing he could do. The bones of his parents, who lived in the neighborhood, were found among the burnt ruins of their home. "Smoke was swirling through cracks in the rubble, enveloping me. It got harder and harder to breathe. It was now or never. Expecting to hurt myself in the process, I marshalled all my strength to get up on all fours. Suddenly bright sunlight penetrated a hole I had created. "I'm out!" Now I was doubly determined. I crawled straight up from the darkness to the sunny open air. As I did so, roof tiles and rocks thudded into the space I had escaped, burying it without a trace." Air-raid alarms sounded in the night, calling Kazuo Matsumuro to duty as a member of a civil defense team. He returned home at 4:00 a.m. on the 6th. When the bomb exploded, he was lying down in his yukata because he had a cold and a fever of nearly 40C°. Kazuoﾕs house collapsed on him, but he got out just in time and escaped to Hijiyama Hill. This is the yukata he wore at that time. 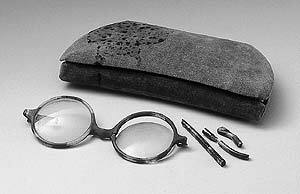 The bones of his parents, who lived in the neighborhood, were found among the burnt ruins of their home. The next day (the 7th), looking southeast from the roof of the new building of Fukuya Department Store. In the left foreground is the steel frame of a warehouse twisted like candy. 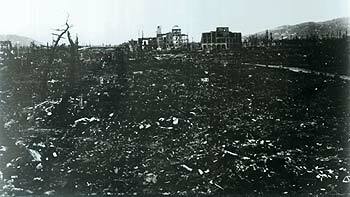 Within 2km of the hypocenter, nearly all buildings were crushed and burned. The damaged area extended as far as 5km. Yagenbori, where Ichio Matsumuro and his parents lived, was burned to the ground. Smoke still rose here and there from the smoldering ruins. 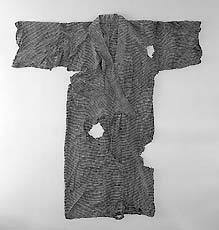 Torako Hironaka (then 31) was exposed to the A-bomb at Tenma cho (about 1,300m from the hypocenter). 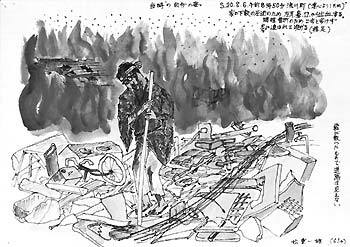 She was a volunteer citizens corps from Otake cho (now Otake city) and was walking on their way to their worksite assigned to help demolish buildings. She received severe burns on the upper part of her body. After receiving first aid, Torako returned to her house and lived as a helpless invalid for nearly half a year. But the burns developed keloid scars. "Houses, electric poles, trees started to burn everywhere. Adults and children with burns over their entire bodies were gasping and pleading, "Save me!" "Give me water!" Glasses, caps, and water bottles were scattered all over. The streets were filled with glass fragments. It was heartbreaking to see so many children crying and dying. They were saying, ﾔI hate America! ' Many adults were killed, too. And I saw dead horses, cats, dogs and other animals." "There was no medicine, so day after day for five months they grated cucumbers and potatoes and applied them to my burns. They heard that the leaves of the tsuwabuki were good, so they used those for a long time. Still, the pus was terrible and maggots appeared in my wounds. I ruined three futon(bedding). At night, the fleas came in droves, and mosquitos and flies tortured me because I couldn't move. My body, like rotting whale meat, could do nothing but lie still. I cannot begin to express in words the pain of a body that cannot move." Kazuji Uesugi (then 52) was exposed while walking on the road about 100m from his home. He hurried back to his house where he found his wife Ayako (then 45) trapped under the collapsed building. He helped her escape. Glass fragments were piercing Ayako's face, and Kazuji, who was struck by the heat rays, was seriously burned on his face, hands, and chest over onto his shoulder. On the 7th, his son, who had just entered medical school in Yamaguchi Prefecture, returned and tended to them using the skills he had just learned about emergency first aid. Kazuji was miraculously spared. The upper part of these glasses was shaded by the brim of his hat. The lower part where it was blackened retains the effects of the heat rays. Satoru Ito (then 41) was a teacher at Hiroshima Prefectural Technical Junior High School. He was exposed to the A-bomb in the school building. After the powerful flash and the roar of the explosion, the blast hit him from the left. The impact was like being whacked by a thick board. He lost consciousness. When he came to, he found he had been blown 30m. He managed to escape from the collapsed school building, but his whole body was pierced by glass fragments. He was covered with blood. He ran around helping students and colleagues, but many died before his eyes. 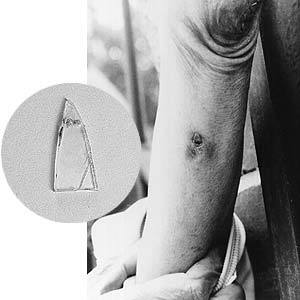 Thirty-three years after the A-bomb in 1978, this fragment broke through the skin on the surface of his left arm. Realizing he was still carrying glass fragments, he had the rest surgically removed.